Hey guys! I've been using DesignSpark Mechanical for my CAD work, and I like it a lot. Folks are always intimidated by learning to draw their own parts for 3D printing, and since DSM has such an easy learning curve I decided to record a tutorial series to help people get up and running quickly. Any thoughts? What would you like to see covered in future episodes? BTW, I don't have any affiliation or interest in the company, I'm just a fan of the software and enjoy helping people learn new skills. This is great! I use SpaceClaim (for now) which is the big brother to DesignSpark. Over the past few months I have been weaning off of SC/DS and moving to Fusion 360. Have you tried it, some things are not nearly as easy to do in Fusion until you learn their methodology. I have the Facets/STL plugin for SpaceClaim engineer. Supposedly it is just a tool set that makes manipulating STL models easier. You are supposed to be able to do most of that functionality manually within the normal tools. Have you tried manipulating imported STL models in DesignSpark? This is cool! The video was a good intro for a beginner. I'd personally like to see the options panel for each tool explained. For example, if you pull an edge, by default you round the edge (there's probably some proper term that I don't know). But if you mess with the options panel, the tool can instead copy the edge, or change the angle of the corner, or whatever else it does. As a self-taught intermediate, I'd say that's where I could personally use the most improvement - playing with those non-obvious features that I don't know either A.) what they do, or B.) that they're even there at all. One other thing I might suggest - since you're designing a useful object (rather than a haphazard mess like a lot of these types of videos are guilty of), I think you should show the end result of what you're modeling at the beginning of the video, then talk about how each tool helps you get there and why you're doing things the way you are. In my head when you finish with each tool, I have no idea what's coming next - I'd rather be thinking "ok, does it make sense to add this screw hole next? Wait no, he's doing something else! Why, is his way easier?" etc. One of the benefits of SC/DS is almost everything can be done with just a few tools like Pull, Fill, and Combine. Pull tool will do standard push/pull but it can also do Rounded Edges, Chamfer, Copy Edge, Extend Edge and Pivots. Fill tools can actually do a LOT. If you created a hole and want to erase it use the Fill tool. If you want to under or remove rounds/chamfers use the Fill tool. The combine tool does all the boolean operations and not just combining. The best thing is to learn the sub-menu options for each of those. For me the best method was to watch all of the free videos on http://www.spaceclaim.com/en/Support/Tu ... tials.aspx and also watch a few of their webinars so you can see an expert use all of these tools together in a normal work flow. You will need to fill out a form but that's the price for entrance to the videos. 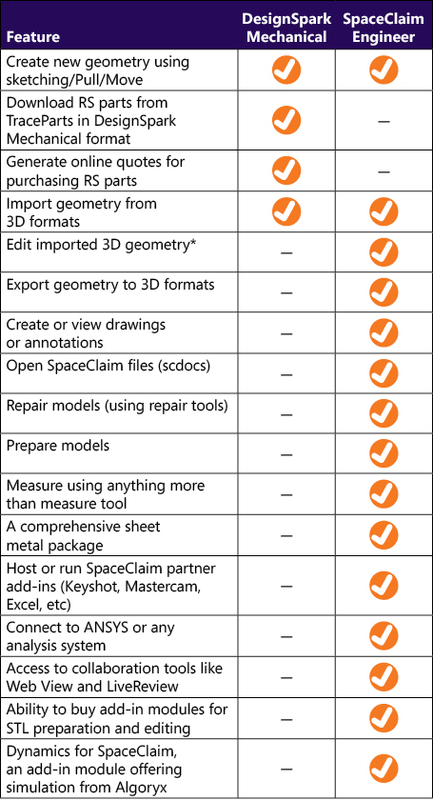 I wish they did not do that but SpaceClaim seems stuck in the old school CAD game still. Is there a difference at all in the basics of SpaceClaim vs DesignSpark? KAS wrote: Is there a difference at all in the basics of SpaceClaim vs DesignSpark? DesignSpark is pretty much SpaceClaim light. If you look closely at the toolbars across the top, SpaceClaim has several more. Tools for model repair, sheet metal, tubing, mesh editing, etc. DesignSpark is the SpaceClaim sketching and direct modeling environment without all of the snazzy tools. That's a great intro video to the software. Definitely more of a "showroom" demonstration for folks that already know how to model, though. I created mine with the 3D printer who's never learned CAD in mind. I hope they take a nod from Fusion 360 and open up the full package to makers and hobbyists. I'm prepping to record V2 of the tutorial. Any requests or suggestions? I was going to go more in depth on some of the sketching tools and how to move and orient the grid and different parts... Is that a logical next step? I need only a few thins to get started, so perhaps the 4 tools you use most, then the 4 sub tools you use most. and then putting holes in places accurately, and pulling a sketch into a model.... but I think locating holes accurately would be the best next video. so that was a fun tutorial jim thanks!! can you do a tutorial on dimensioning, changing dimensions of an object, and locating holes "not" on the center of a square, say on the arc of an ellipse. The biggest difference (for the casual user) in my opinion between SpaceClaim and DesignSpark is the import/export options in SpaceClaim. The fact that I can't export my designs to a universal format is one of the primary reasons I continue to use Fusion 360. Jimustanguitar wrote: I hope they take a nod from Fusion 360 and open up the full package to makers and hobbyists. I think this is a pipe-dream since they were picked up by ANSYS for big money. SpaceClaim is currently $2500-$3000 per license and they seem to be targeting professionals not consumers.